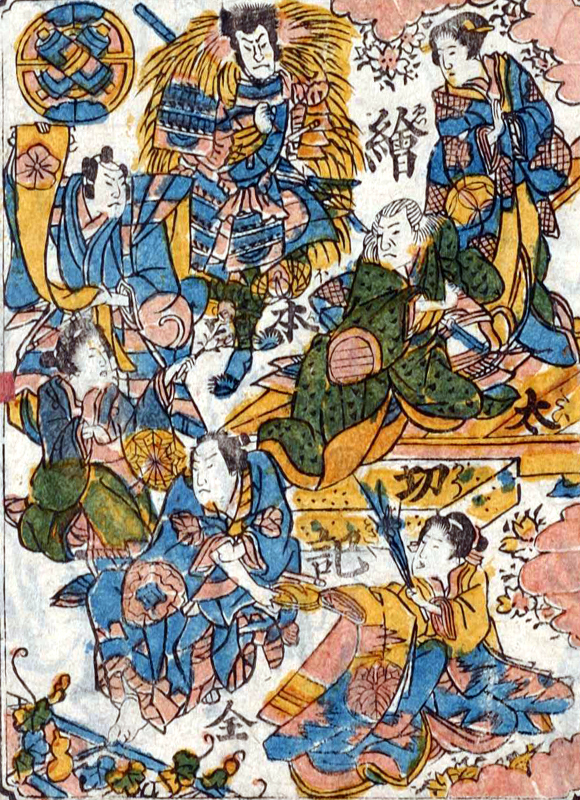 The play "Ehon Taikôki" was originally written for the puppet theater (Bunraku) and staged for the first time in the 7th lunar month of 1799 in Ôsaka at the Toyotakeza. It was adapted for Kabuki the next year by Nagawa Tokusuke I, entitled "Ehô Taikôki" and staged for the first time in the 11th lunar month of 1800 in Ôsaka at the Kado no Shibai [casting]. It was staged with the original title for the first time in the 7th lunar month of 1802 in Kyôto at the Kitagawa no Shibai. The title "Ehô Taikôki" was still used in Ôsaka up to the beginning of the 1820s. Only the tenth act became a classic of the Kabuki reportoire. The National Theatre had the good idea to produce a tôshi kyôgen revival of "Ehon Taikôki", staging acts 1, 2, 6, 9 and 10 in November 2005 [casting]. This play is made up of 13 acts. The 10th act, the "Amagasaki Kankyo" act, is still part of the Kabuki repertoire and is staged quite often.